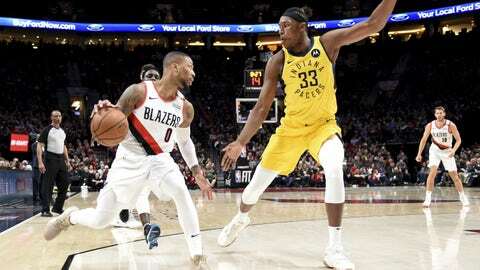 Myles Turner had 28 points and 10 rebounds for the Pacers, who missed out on clinching a playoff spot in the East. Bojan Bogdanovic‘s layup pulled the Pacers to 100-91 with just under three minutes left, and Turner made free throws to get Indiana closer. The teams traded free throws down the stretch, but Portland was stung when Nurkic fouled out. Wesley Matthews‘ layup closed the gap to 102-97, but Al-Farouq Aminu made free throws on the other end and Portland held on. Pacers: Domantas Sabonis received warm applause from the crowd when he entered. His dad, Arvydas, played for the Blazers from 1995-2001 and again during the 2002-03 season. … Matthews, who played five seasons in Portland and was a fan favorite, was similarly greeted. Trail Blazers: Portland won the first meeting this season 103-93 in October. It is the second straight year that the Blazers have swept the season series against Indiana. … It was Lillard’s ninth double-double of the season.